This world has gone through many Dusks, and is slowly nearing its end. Within this world, in the western reaches of the "Land of Dusk," there was a nation that prospered thanks to its use of alchemy. There, in order to survive the eventual arrival of the "Dusk End," the people devoted their efforts to rediscover and recreate lost alchemic technologies. Rediscovered technology from the past era was gathered in the alchemy research city known as "Central," where research was conducted on how to halt the advance of the twilight. One of the heroes is a young man who researched alchemy in Central, the other a girl living in a small town on the frontier. This girl's name is Escha. In the process of using her knowledge of ancient alchemy to help others, she was assigned to the Development Department. The young man's name is Logy. 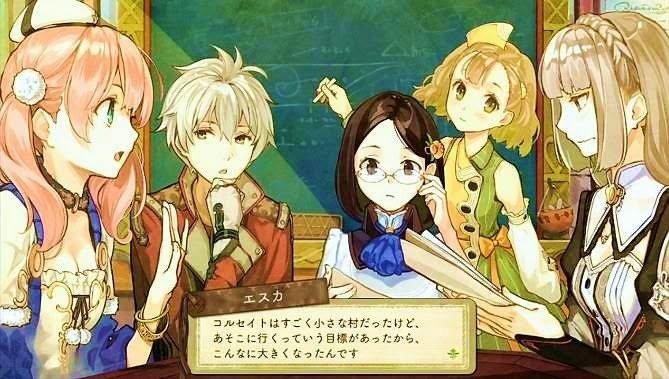 Having learned the newest alchemic techniques in Central, he requested a transfer to this understaffed town to make use of his abilities, and meets Escha when he is assigned to the Development Department as well. The two make a promise to use their alchemy together, and bring success to the Development Department. Aired: Apr 10, 2014 to ?